Gas Fired Melting Furnaces-maximum temperature 2400 deg F. Will run on natural gas or propane-adjust the gas air mixture accordingly (no orifice to change). If the furnace is to be installed into a pit, please call for pit dimensions and blower configurations. 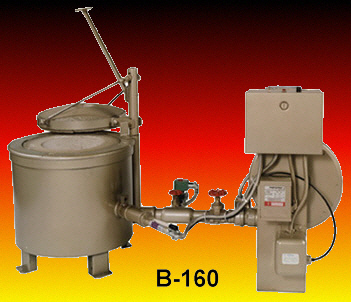 The primary differences between the Soft Metal Melters and the High Speed Melters are the cover design, melting speeds and temperature range. 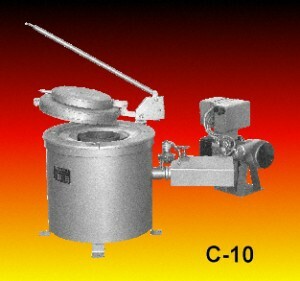 The Models C-10 and C-20 will melt aluminum and brass at moderate speeds and do not attain the high temperatures necessary for melting grey iron. The differences in cover design is obvious in the illustrations. When using the furnace as a pot melter, a cast chrome iron melting pot is supported in the furnace chamber by the ring section of the cover. When aluminum is ready to pour, a detachable pouring handle locks in the lifting eyes of the melting pot and then is poured into the molds. The metal being melted is always visible and the ease of handling the melt makes this model extremely popular in Junior and Senior High Schools. For melting brass at higher temperatures, the cover lid is dropped to close the pot ring opening. The cover is raised and pivots to the rear of the furnace so a crucible can be charged into the furnace chamber for the melting cycle. Slower melting speeds and lower temperatures allow the use of Super Duty High Alumina Refractory. Crucible tongs and shanks are required for withdrawing and pouring the crucible of metal. 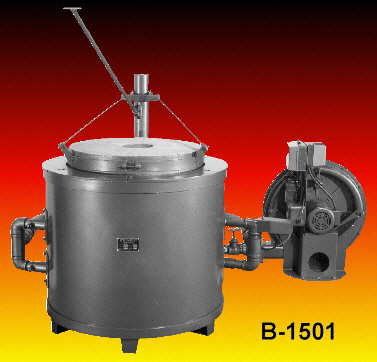 COMBINATION CRUCIBLE AND POT FURNACE for melting aluminum or lead in a steel or cast iron pot suspended in the ring section of the furnace cover, or for melting aluminum and brass in a crucible inside the furnace chamber. 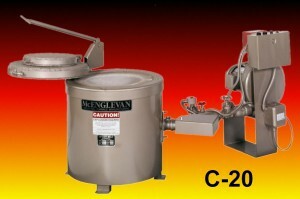 Temperature range 1200° F to 2400° F.
MELTING TIME for melting a cast iron pot of aluminum approximately 24 minutes. Melting time for crucible in closed furnace chamber for aluminum approximately 18 minutes, for brass approximately 35 minutes. 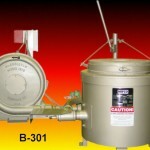 Furnaces are supplied with a No. 4 Ultra Violet System with spark ignition. SECTIONAL HARD BURNED LINING and two piece cover are High Alumina Super Duty refractory, capable of withstanding temperatures in excess of 3000° F. The refractory sections are kiln fired to develop excellent resistance to scuffing and spalling. The sectional design prevents cracking due to thermal expansion. All shapes are cemented in place with high temperature mortar. The combination of pre-burned sections and high quality alumina refractory provides exceptionally long lining life. The combustion chamber lining is backed by a wall of high temperature refractory insulation which reduces heat loss through the furnace walls, gives more comfortable operation and greater efficiency. Relining kits are available for field installation. STEEL WELDED CONSTRUCTION of heavy gauge furnace shell and reinforcing members conform to industrial specifications. Hot rolled bar is used for support rings and lid bands. The two piece furnace cover is recessed in a cast chrome iron top protection plate. The lid derrick is front operating, with removable handle. Lid swings to rear of furnace when open. A drain hole is located in the bottom of the furnace for drainage of overflow of metal. The exhaust port is at the rear of the furnace. 1/3 HP 225,000 1" 1/2" 4-6 oz. 1/2 HP 325,000 1-1/4" 3/4" 6-8 oz. Aluminum: 10 lbs. to 225 lbs. Brass: 45 lbs. to 675 lbs. Grey Iron (CLASS 25-30 ONLY): 45 lbs. to 675 lbs. 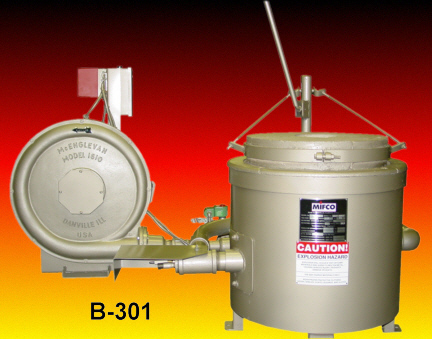 MIFCO manufactures some of the most versatile melting furnaces available. The wide temperature range will allow the melting of most non-ferrous metals used in casting and some grey iron up to class 30 or 35. 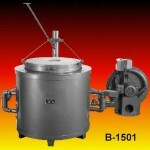 All of these units have a temperature range of 1200° to 2400° F and are designed to melt as rapidly as possible. In the school shop or industrial foundry, these units have an immediate and profitable application. They cover nearly the entire range of modern melting needs. The initial investment for this type of industrial equipment is nominal and the maintenance is held to an absolute minimum due to the rugged construction and high quality of the furnace lining. The outer shells of MIFCO furnaces are heavy gauge steel, reinforced where necessary, with rolled steel bars and welded throughout. The rugged construction conforms to the highest industrial standards. The lid support rings are also constructed of heavy gauge rolled steel bars. The furnace lids are recessed in sectional cast chrome-iron protection plates. The lid derrick is simple in design and sturdily constructed with a detachable handle to prevent overheating. Structural steel legs provide air circulation beneath the unit to prevent overheating of the foundry floor. 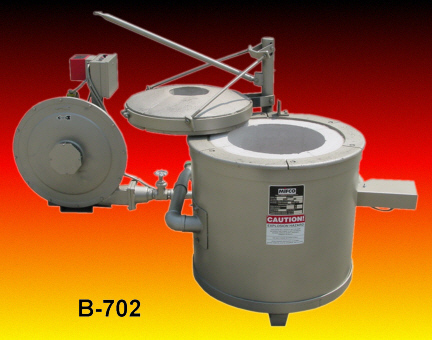 The low operating height provides greater convenience for charging of the crucible. 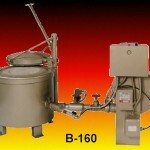 Each unit is provided with an overflow and drain hole in the base of the furnace. Super-duty, high alumina, hand-made, air rammed and pre-fired refractory shapes are used in the lining and dome shaped lids of all MIFCO High Speed Melters. The rapid melting schedules and capacity to melt grey iron make it mandatory that we use the best refractory material available to insure long life of the furnace lining. Super-duty high alumina can withstand the drastic temperature changes due to rapid heating and can operate at temperatures in excess of 3000° F without spalling or deterioration. Sectional linings facilitate movement during heating to prevent thermal cracking and deterioration of the lining and lid. Field replacement of the linings and lids is rapid and easy. 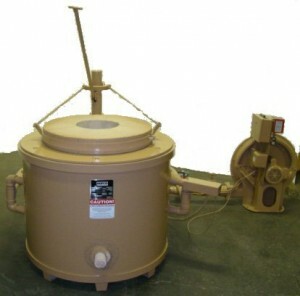 Refractory relining kits are available for all MIFCO furnaces. High temperature castable insulation between the steel shell and the combustion chamber lining combine high strength and excellent insulating properties. This provides faster heating, lower heat loss and greater burner efficiency. The MIFCO gas-air mixer will utilize any type of fuel gas – natural, bottled or tank. The venturi design of the aspirator mixer develops a slight suction against the main gas line, eliminating the need for check valves. The standard mixer system is a manual two-valve control which permits the operator to set any type of flame or atmospheric characteristics desired. Both the gas and air valves are conveniently located. 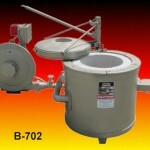 The type of fuel gas can be changed as desired without having to change an orifice or jet on the mixer. Each furnace is shipped complete with a blower. It is only necessary to make gas and electrical connections and the furnace is ready to operate. Combustion safeguard systems are standard equipment on all MIFCO furnaces. The burner control is an industrial type, electronic unit activated by a flame sensor that detects the ultra-violet spectrum of the burner flame. Response to a flame failure of any kind is within 2 to 4 seconds and flame monitoring is continuous. The burner system is ignited by a timed electronic spark. In the event of a flame failure, reset of the burner control is manual. 4-6 oz. 1-1/4" 3/4" 594 lbs. 6-8 oz. 1-1/2" 1" 920 lbs. 8-10 oz. 2" 1-1/4" 1,676 lbs. 10-12 oz. 2" 1-1/4" 2,786 lbs. 10-12 oz. 2" 1-1/4" 3,110 lbs.